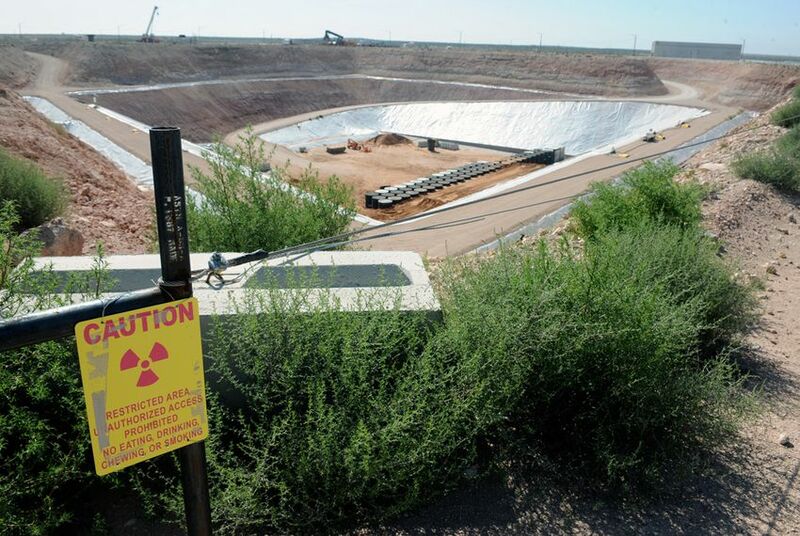 UPDATED: A radioactive waste site in West Texas has received its first truckload of transuranic waste from the federal government’s nuclear weapons program, following wildfires and a radiation leak in New Mexico. A storage facility in Andrews County, Texas has received its first truckload of transuranic waste from Los Alamos National Laboratory, the U.S. Department of Energy and the New Mexico-based Nuclear Waste Partnership said Wednesday in a news release. The truck arrived safely, and as many as 10 shipments per week are scheduled over the coming months, the release said. The private facility, operated by Waste Control Specialists, will be paid up to $8.8 million to store the waste for as long as a year. In a matter of days, a West Texas radioactive waste site is expected to start receiving up to 420 truckloads of radioactive junk — some dating back to the 1940s — from the federal government’s nuclear weapons program. The transuranic waste — clothing, tools, debris and other items contaminated by radioactive elements, mostly plutonium — is currently stored at Los Alamos National Laboratory, which has been under pressure to remove the waste from its grounds since a series of wildfires raged dangerously close to its grounds in the summer of 2011. Under a deal with the state of New Mexico, the laboratories promised to send the waste away by June 30. The materials were destined for the Waste Isolation Pilot Plant outside of Carlsbad, N.M. But that underground facility — the country’s only underground disposal site for transuranic waste — has been shuttered for more than six weeks after an above-ground release exposed 17 workers to radiation. Now, the federal government is poised to send the waste to the site in Andrews County, just across the border, for storage until the repository reopens. The company, formerly owned by the late Dallas billionaire Harold Simmons and one of few sites in the nation that is licensed to store low-level radioactive waste, has been storing contaminated items from shuttered reactors and hospitals since 2012. Baltzer said that all incoming canisters would be inspected to ensure that they are sealed. "WCS has a sophisticated inspection and monitoring system in the buildings where the canisters will be stored to ensure the safety of our employees and the environment,” he added. Citing uncertainty about when the repository will be ready to reopen, the U.S. Department of Energy has not proposed an end date for the waste’s time in Texas, but said it would last no longer than one year, according to the agency’s correspondence last week with Texas regulators. In a March 21 analysis, the agency concluded that it could safely store the Los Alamos waste in West Texas and that the plan did not merit a new environmental review. There have been minor spills and leaks at the facility, the analysis said, but those had been localized and properly cleaned up. “WCS has accumulated more than a decade of environmental monitoring data that show no member of the public or the environment has been affected by operations at the facility, including routine and accident risks,” the analysis said. Dale Klein, associate director of the University of Texas Energy Institute and the former chairman of the U.S. Nuclear Regulatory Commission, said the waste would probably be safely transferred and stored, but he questioned the logic behind moving the waste before it goes to the repository. “Any time you have to handle the material twice, you're exposing people unnecessarily,” he said. Environmentalists object to the idea of bringing more nuclear waste to Texas and say they would like to see further analysis of the proposal. “They’re building a nuclear empire. It’s just one thing after another, and there’s no telling where this leads,” Karen Hadden, executive director of the Sustainable Energy and Economic Development Coalition, said of the waste company, adding that state and federal regulators have rushed the decision to allow the waste transfer without using "the full and adequate science." Environmental groups have closely scrutinized WCS as it has expanded the scale of the waste it accepts. That includes the Sierra Club, which has challenged the site’s permits in court, saying the group was never given a hearing to voice its objections to the project — namely that groundwater would enter its disposal wells. TCEQ said it would work with the Department of Energy to ensure that any material the WCS site accepts would meet state requirements. When the Legislature paved the way for waste storage more than a decade ago, the facility was supposed to accept only waste from Texas and Vermont, but the Legislature has since expanded the site’s scope to accept waste from other states. Burnam, a fierce critic of WCS over the years, said he might seek a court injunction to halt the waste transfer. “That would have to come quickly,” he said.